It is a rare but life-threatening syndrome caused by inadequate flow of blood through the mesenteric vessels resulting into ischemia and gangrene of the bowel wall. The mesenteric infarction is the acute closure of an intestinal vessel, which leads to the critical insufficient supply of the intestine with infarction and necrosis of the portion supplied through the vessel. It can be either an infarction of an artery or a vein around the closure. In cases of acute visceral arterial occlusion, it is a disease mostly of elderly people over 60 years. The disease has no sexual predilection, but men are thought to have a higher risk of atherosclerotic disease that is a risk factor. Women on oral contraceptive pills have an increased risk too. It is predominantly thrombo-occlusive in nature and thus it is commonly known as mesenteric vein thrombosis (MVT). The acute vascular occlusion affects about 85 % of the superior mesenteric artery, which is predisposed due to its large caliber and the narrow-angle of departure from the aorta for embolism. A closure of the inferior mesenteric artery usually has a mild course, since it supplies a less large part of the intestine. In 50 % of the cases, it is about arterial embolism. The embolus is thereby usually of cardiac origin and is produced, for example, during atrial fibrillation in the left atrium, in the case of an endocarditis or a heart wall aneurysm. In 15—20 %, it is about arterial thrombosis, in 5 % about venous thrombosis. 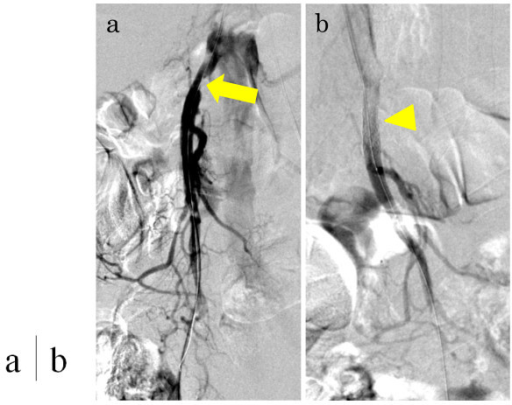 These venous mesenteric vein thrombosis occur especially among young women under oral contraceptives, in the case of consumptive disease, pancreatitis, protein C and S deficiency and thrombocytosis. In 20—30 % of the cases, it is about the sealless infarction, also called nonocclusive mesenteric disease (NOD). This leads to a reduced perfusion of the splanchnic area here through an extreme α-adrenergic stimulation with a reduction of the cardiac output. The causes can be cardiac insufficiency, heart attack, marathon running, vasospasm, glycoside treatment or long-term high doses of catecholamines. A three-phase course is typical of the mesenteric infarction. The initial phase is the stage of infarction and occurs within six hours after closure. It is characterized by an incipient acute abdominal pain, which feels like a knife wound, accompanied by hyperperistalsis with nausea, vomiting and possibly diarrhea. In the second stage, the stage of the wall necrosis, a paralytic ileus occurs with a decrease in pain, which is called “false peace.” This symptom-free interval occurs six to twelve hours after the vessel occlusion. Typical here is a discrepancy between the poor general condition of the patient and the discreet findings on palpation of the abdomen. 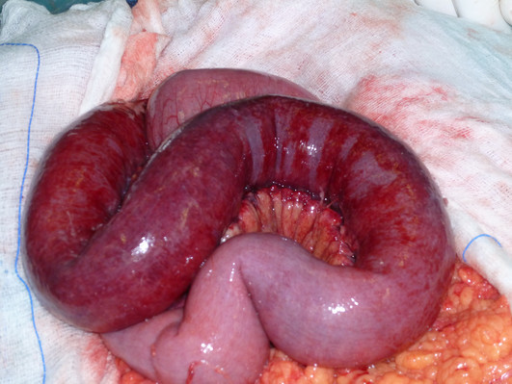 The stage of the diffuse peritonitis is the third phase and occurs through a migratory peritonitis, which leads to the acute abdomen with bloody diarrhea through bleeding into the necrotic intestinal wall and to circulatory shock and even death. Note: Melena is a warning sign at the stage of the false peace and should lead to the aggressive diagnosis like exploratory laparoscopy without further loss of time. In case of clinical examination, the abdomen is usually soft with diffuse tenderness during the symptom-free interval. An indication of a mesenteric infarction is given by blood on the finger stall during the digital rectal examination. Typically, the lactate, the lactate dehydrogenase and the hematocrit are increased in routine laboratory due to fluid loss and there exists a metabolic acidosis due to hypoxia in the blood gas analysis; even a leukocytosis is not atypical. Note: A serum lactate level over 20 μg/ml is almost conclusive at a sensitivity and specificity above 90 %. An indication of the etiology of mesenteric infarction during atrial fibrillation or undergone heart attack may occur in the ECG. An ileus can be detected in conventional X-ray from the second stage onwards, while it is still unremarkable in the first stage. It can also be detected by sonography. The advantage of sonography is the fact that by duplex sonography, the ischemia can be self-represented. 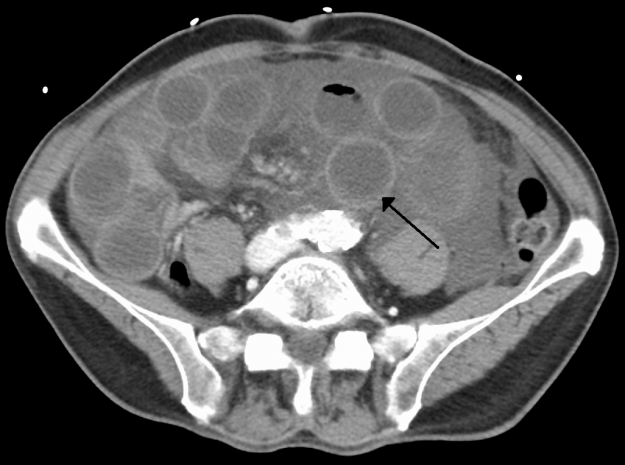 The angio-computed tomography is best suited to rule out other causes of acute abdomen and is considered the standard investigation in accordance with the contraindications. It must necessarily be carried out, even in the lateral projection. In addition, the intestinal wall edema and vascular occlusion can be detected here. The method of choice for the detection of an arterial vascular occlusion in the case of uncertainty of the diagnosis is the conventional coeliacography/mesentericography or MR angiography. Note: Continuous central artery segments in the angiography do not rule out a heart attack. Differential diagnoses include acute pancreatitis and acute aortic dissection. 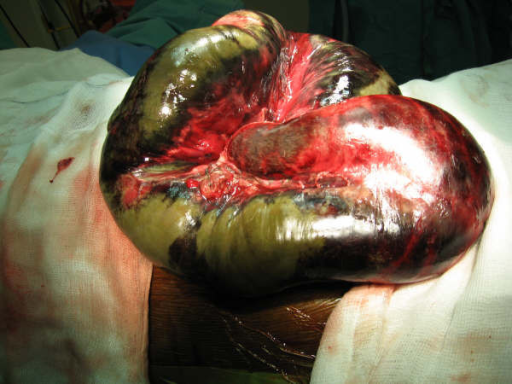 If you suspect a mesenteric infarction, an exploratory laparotomy is indicated. Immediate measures that should be taken, even before, are the conditioning of a nasogastric tube to relieve the intestine, the fluid and electrolyte replacement, correction of acid-base balance and the intensive monitoring. In the case of patients with a very poor general condition, a laparoscopy is done to determine the extent of necrosis for the purpose of the decision of the eventual therapia minima in order to avoid a possible “unnecessary” laparotomy. The laparotomy occurs in patients with a sufficiently general condition. A palpation of the vessels is carried out intraoperatively for the localization of the vascular occlusion; thereafter, an embolectomy, desobliteration or bypass supply follows. 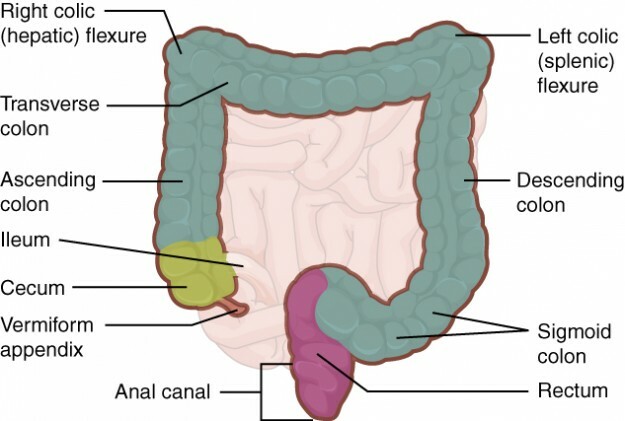 In addition, a thorough inspection of the intestine for the identification of necrotic sections is important, which must necessarily be resected. The assessment of the vitality of an intestinal loop occurs intraoperatively by their color, which should be rosy, their peristalsis, which can be triggered by knocking and the pulsation, which must be both centrally as well as peripherally available. Even the arterial bleeding from the cutting edges is important for assessing. If doubts exist here, the intestinal loop is wound for ten minutes in wet wipes and then re-assessed. If an intestinal section is not completely removed, it can perforate and lead to peritonitis. The production continuity is carried out by means of an end-to-end anastomosis, but often only one discontinuity resection and drainage is possible in case of intestine ends remaining in situ as stomata. About twelve hours after the primary operation, a second-look operation is necessary, in order to ensure that the remaining sections of the intestine are sufficiently supplied with blood. A relaparotomy is necessary in the case of newly emerging, persistent signs of peritonitis, again increasing lactate levels or angiographic evidence of reocclusion. Note: In the case of extensive infarction with the inclusion of the duodenum, there is no possibility of a restoration – neither by resection nor by small intestine transplantation. Life-prolonging treatment should generally be avoided in this situation. One speaks of a therapia minima. A conservative treatment is indicated in non-occlusive mesenteric disease with no evidence of Peritonis. You must necessarily be in the ICU under cardiological care. The basis is the treatment of the underlying disease to eliminate the vasoconstriction and intestinal ischemia. If there is a reasonable suspicion of an intestinal wall necrosis in the NOD, the infusion of papaverine or Prostavasin as antispasmodics via an arterial catheter may take place. Note: In case of signs of peritonitis, the patient must immediately be brought to a surgical therapy. In the early phase of mesenteric infarction, interventional therapy comes into question. A catheter technical thrombectomy or embolectomy by Fogarty catheter and the selective introduction of lytic drugs are used. The full heparinization until the conversion to oral anticoagulants is a part of the post-treatment, as soon as the healing has been fully completed, if the embolic risk still exists. Even the highly dosed broad spectrum antibiotic is important to avoid peritonitis. During the operation, intra-abdominal swabs should be made so that the antibiotic can be customized. A sign, which indicates a complication-free healing, is an early “getting started” of the intestinal function. In the case of an intestinal atony over 72 hours, methods may be necessary for the stimulation of the intestinal function. Relapse, suture insufficiency, sepsis and kidney, lung or liver failure is among the postoperative early complications. As a late complication, it may result in a malabsorption and short bowel syndrome with fluid and electrolyte losses through large resections. In the early stage, the prognosis is good for an immediate therapy. The operative lethality is about 5 %. Depending on the ischemia time, the lethality increases rapidly. After twelve hours, it is 30 %, after 24 hours at about 85 %. In most cases, the lethality is high because the diagnosis is carried out late; the resection must be large and mostly elderly patients in a rather poor condition are affected. The acute mesenteric infarction cannot be clinically differentiated from the mesenteric vein thrombosis, which is why they are often only distinguishable from each other by laparoscopy. Possible symptoms are diffuse of abdominal pain, an intestinal paralysis and an emerging ascites, whereby the less painful and slow onset is typical in contrast to arterial occlusive. The suspicion of a mesenteric vein thrombosis can be confirmed by means of a duplex sonography of the portal vein and the superior mesenteric vein. The indirect splenoportography in DSA techniques gives detailed information about the perfused or sealed portions of the venous mesenteric flow path. Here, the angiographic catheter is inserted into the splenic artery or the superior mesenteric artery, by which specifically the contrast medium outflow can be represented via the splenic vein or the superior mesenteric vein into the portal vein. The lethality in the case of an acute mesenteric vein thrombosis is about 20 to 40%. The Ortner’s syndrome, also known as abdominal angina, is the chronic occlusion of visceral arteries, whereby it results in the intestinal claudication with typical symptoms. The patients are usually older than patients with acute mesenteric infarction. Chronic mesenteric circulatory disorders can be caused by arteritis such as thromboangiitis obliterans or periarteritis nodosa, fibromuscular dysplasia or by external compression as in tumors or lymphomas. Since the coeliac trunk, as well as the superior and inferior mesenteric artery is connected via the gastro- and pancreaticoduodenal artery and via the riolan anastomosis, the chronic closures remain asymptomatic for long because of adequate collaterals. The ischemic colitis is, in addition, a frequent complication after the implantation of an aortic prosthesis with ligation of the inferior mesenteric artery. The typical triad of symptoms of intestinal angina in the case of closure of the superior mesenteric artery consists of postprandial pain, malabsorption with weight loss and abdominal vascular murmur. Seldom, however, all three symptoms are present. The most common is the 10—30 minutes postprandial occurring dull abdominal pain. It is periumbilically localized and lasts for one to four hours. The cause is the increase in blood flow after the food intake by ten to twenty times. The flow rate reserve is however limited, whereby it results in the relative circulatory distress of the intestine with pain syndromes. The pains prevent the patient from the intake of large amounts of food. For this reason, it results in a weight loss in combination with the malabsorption. Other atherosclerotic lesions such the PAD or CHD are often found in the patient’s medical history. In the clinical examination, stenosis sounds can be auscultated over the abdominal vessels. The evidence of the chronic intestinal vasoocclusive processes usually works out angiographically. The treatment of the Ortner’s disease is the revascularization. In the case of the closure of the coeliac trunk and the superior mesenteric artery, this is achieved through a bypass surgery, in the case of chronic occlusion of the inferior mesenteric artery, through a plastic patch. 1. A 68-year-old otherwise healthy woman complains about an acute onset of severe abdominal pain after lunch. Her husband insists on calling an emergency doctor, but when he arrives, the pains had already decreased and the woman complains about only slight nausea. The emergency doctor assumes mild food poisoning and gives the patient MCP drops, which she should take when needed up to three times a day. At night, the pain has however recurred, and the woman is feverish and tachycardic. The ambulance called by the man takes the woman immediately. 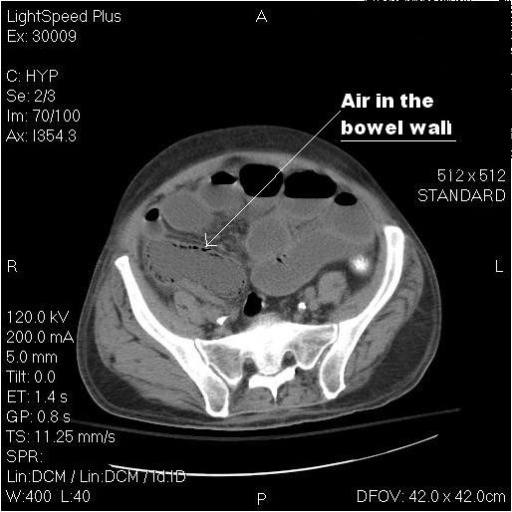 In the CT of the abdomen, an intestinal wall edema and a paralytic ileus with standing levels are shown. Because of a suspicion of mesenteric infarction, the patient is immediately brought in the vascular surgical operation. There is an open laparotomy and the surgeon must recognize that already a large part of the small intestine is blackened. Even the duodenum is affected. Which approach is now appropriate? The finding of the embolus and an embolectomy in combination with a resection of the entire necrotic intestine and a removal of the deposition ends as stomata. The finding of the embolus and a bypass surgery in combination with a resection of the entire necrotic intestine and an end-to-end anastomosis. The finding of the embolus, a bypass surgery and a second look laparoscopy in order to see if the intestine has recovered. A closure of the abdomen and a therapia minima since a lethal outcome is certain. An intra-arterial lysis therapy via a catheter, which is introduced into the sealed vessel and a resection of the necrotic intestinal segments. 2. What is the typical symptom of Ortner’s syndrome? 3. What is not one of the common causes of acute visceral arterial occlusion? Schwartz, L. B., &Gewertz, B. L. (1997). Mesenteric ischemia. (Surgical clinics of North America.) Philadelphia: W.B. Saunders. Wilhelm, M. C., & University of Virginia. (1981). Mesenteric ischemia. Charlottesville: School of Medicine, Univ. of Virginia.